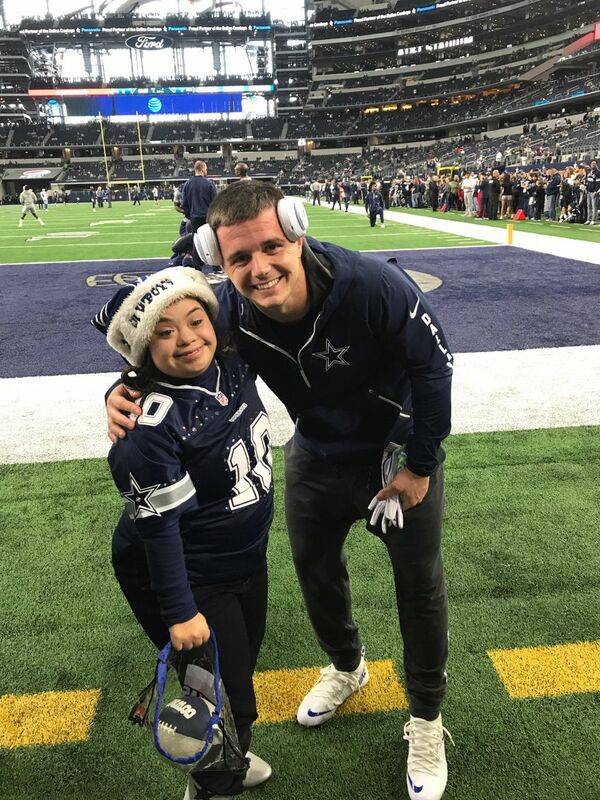 Dallas Cowboys' wide receiver Ryan Switzer poses with his biggest fan, "Diva" Viva Selena Lopez prior to Sunday's game between the Cowboys and the Seattle Seahawks. The only thing that could’ve possibly topped Diva Viva’s Christmas would’ve been a victory by the Cowboys on Sunday against the Seattle Seahawks. Other than that, the past couple of weeks have been more than a dream come true for 22-year-oldPalmview resident Viva Selena Lopez. It all started two weeks ago when the City of McAllen invited about a dozen or so kids from the Capable Kids foundation to meet with the VIPs of the McAllen Holiday Parade. Among those VIPs included the Dallas Cowboys’ Ryan Switzer. Viva has Down Syndrome and was one of the lucky participants. She wouldn’t let her 15 minutes of fame pass her by. Mary Jane made a video of their introduction and tagged Switzer. Switzer’s dad saw the tag and immediately responded. Capable Kids Foundation is a non-profit organization that aims to identify and address social & physical needs for children with disabilities in the RGV area. “It says a lot that the city would give a foundation like ours the opportunity to do that,” said Esmer Leal, executive director of the foundation. “They see the kind of work we have done and they’ve participated in several things. They see that it’s all about the kids. Mary Jane took a video of Viva opening the Christmas packages. It shows Viva, her nails painted either bright red if glittery gold (“She loves everything bling,” her mom said.) as she opens the package and pulls out a sheet of paper. She looks back into the package and pulls out a plastic covered jersey – she doesn’t realize what it is for a second, then her left hand goes to her mouth to stifle a scream followed by both hands rising to her eyes as if to say she can’t believe what she’s seeing. She laughs and cries as she opens up the package to see that yes, it’s a No. 10 Ryan Switzer jersey. Her mom put it up and Twitter and it has had more than 100,000 views. But it didn’t stop there, several people wanted to take it a step further. One person gave Viva and her mom a pair of tickets to Sunday’s game, another flew them out to the game and another put them up in a hotel. And then Ryan heard his favorite new fan was at the game. Another VIP at the parade was Ana Maria Polo, the star of the Telemundo show “Caso Cerrado.” After meeting the mom and daughter, someone called from the show to invite them on it. There, Viva and her mom had the opportunity to tell Viva’s story, which included bullying and cyber bullying. Opening doors and stealing hearts seem to be especially strong skills for Ryan Switzer’s biggest fan. Mary Jane said it’s hard for her and Selena to go anywhere these days without someone recognizing her either from a tweet or Facebook post, or television show or newspaper article. And while all the extra perks have been a wonderful whirlwind of experience for Viva and her mom, it was the rookie wide receiver from the Dallas Cowboys that was, is and probably will be the most memorable for Diva Viva.